With more than a decade of lackluster performance behind us, some may be considering the options market as they attempt to charge up their stock portfolios. For decades, you’ve been told to diversify your money in the stock market and as long as you invested early and often, the “long run” would take care of any hiccups along the way. October 2011 saw the Dow Jones Industrial Average drop below 10,500. The last time it had gone that low was April 1999—a virtual “lost decade” for an index we consider diversified. And that doesn’t account for inflation and opportunity costs. You can be in a stock for 10 days or 10 years. Yet, once you figure out what to buy, is there a way to protect stocks without limiting potential profit? BUY STOCK OR ALREADY HOLD THE STOCK. If you own the stock, you don’t have to buy it again. BUY OUT-OF-THE-MONEY PUTS. For each 100 shares of stock owned, buy put contract with strike prices below the current stock price. This partially protects the stock position against a drop in the stock price. The closer the put strike price is to the underlying stock price, the greater the protection and the cost. A larger gap between the put strike price and the stock price makes the option cheaper but offers less protection. SELL OUT-OF-THE-MONEY CALLS. For each 100 shares owned, sell call contracts with strike prices above the stock price, typically with the same expiration month (though not always). This helps pay for the puts. Naturally, investors bullish on the stock (and why would they be holding the stock at all if they did not have a bullish bias) would rather not liquidate the stock. This strategy does involve the risk the stock could be called away. THE COLLAR P/L While a stock that is collared is limited in its upside potential, likewise, its risk is limited on the downside as well. Do you rely on short-term horizons like a trader? Or do you invest for the long term? Regardless of habits, the initial construct of the collar is the same. Differences arise when adjusting the collar. 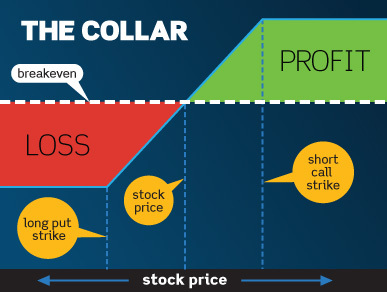 Adjusting the collar would mean altering the original position in some way in an attempt to capture a profit or minimize a loss in the call “leg,” the put leg, or the stock leg. For example, if the stock drops in value, and the put value increases, one adjustment might be to sell the put and use the proceeds from the gain to purchase more stock and another put at a lower strike price. The disadvantage to adjusting is, of course, the transaction costs involved. Short-term traders might see more adjustments than long-term investors for two reasons. One, short-term traders typically make use of options with shorter expirations, so decisions may be made at or near option expiration. Two, shorter-term options typically involve a greater proximity to current stock prices. If you place an option too far out of the money, it may not have enough premium, and the trade may not be worth it. Having the option closer to the stock price at inception means the stock doesn’t have to travel as far to force an adjustment. The advantage of the shorter term is you can adjust the strikes as the stock moves and allows you to reset your targets on a more regular basis. It also allows you to have an average volatility for the year, rather than being locked in to one volatility level for a long time. COLLARS FOR THE SHORT-TERM TRADER Maybe you’re bullish on a biotech company that’s got an earnings announcement in a week. Maybe there’s positive news and significant stock appreciation. There’s nothing wrong with buying stock in this context. Yet, with event-driven speculation, it’s a good day when you’re right. But it may be prudent to collar, and protect, for the days you’re wrong. COLLARS FOR THE LONG-TERM INVESTOR On the other hand, you may prefer the buy-and-hold approach, leaving the guesswork to speculators. That said, you’d like the chance to dedicate a portion of your account to higher-priced stocks more susceptible to large corrections. In this case, you may want to purchase and hold your stock, and collar your investment with longer-term options. In the end, both approaches have benefits and risks. The key is to pick the type of collar that best fits your style. How do you choose option expirations and strikes? For the collar put, determine how much protection you want. If you buy a put further out of the money, it will be less expensive, but your stock position will lose more before the long-put protection kicks in to offset losses. Puts closer to the money provide more protection. But they cost more. Selling the call generates positive time decay. Time is working in your favor as days go by. You sell it, take cash into your account, and if it expires out of the money, you keep that cash as profit on the short call (less any applicable commissions and fees). The closer the strike price of the call is to the current stock price, the larger the credit when you sell it. But the stock’s profit potential is capped at the strike price of the short call. Place the short call strike too close to the current stock price, and you’ll cap the profit on the stock pretty quickly. Place the short call far away from the current stock price, and you’ll take in a smaller credit. That’s the trade-off. One helpful tip: the long put doesn’t always have to be in the same expiration as the short call. You may want to buy a put in a further expiration. It will cost more (all things being equal), but will decay more slowly. One other thing to consider would be a no cost-credit collar. In most cases, you will have to be closer to the money on the call side than the put, but not having to spend money for protection is very attractive. What does this all mean? 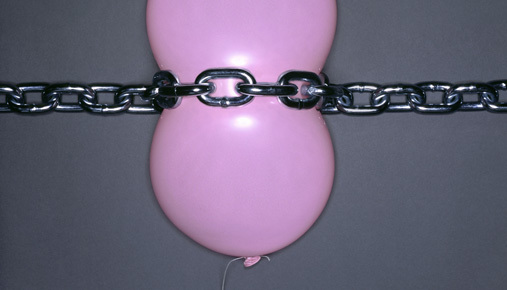 You might want to consider a collar strategy if you are looking to hedge stock positions against large declines or seeking ways to create more stability within a portfolio. Of course, collar strategies are not suitable for everyone, so be sure you understand all of the risks involved with the strategy you select before trading. Before investing in an ETF or mutual fund, be sure to carefully consider the fund’s objectives, risks, charges, and expenses. For a prospectus containing this and other important information, please contact the fund company or a TD Ameritrade Client Services representative at 800-669-3900. Please read the prospectus carefully before investing. The information contained in this article is not intended to be investment advice and is for educational purposes only. Specific securities appearing in this article are not recommendations. For all example-securities shown, TD Ameritrade and associated persons have not conducted market-making activity, do not have a financial interest other than nominally, and have not managed or co-managed a public offering. ETFs are registered investment companies that trade on an exchange like a stock. Commission fees typically apply. Those who practice frequent dollar-cost averaging and active traders may generate trading costs that outweigh any cost benefit. Trading prices may not reflect the actual Net Asset Value of the underlying securities. ETFs can entail risks similar to direct stock ownership. ETFs can entail market, sector, or industry risks. Some ETFs may involve international risk, currency risk, commodity risk, and interest-rate risk. Investors should be aware that there are material differences between the subjects of comparison in this article, which may include investment objectives, costs and expenses, liquidity, safety, fluctuation of principal or return, insurance, tax features, and any other investment characteristics. The collar position involves the risks of both covered calls and protective puts. A covered call writer forgoes participation in any increase in the underlying stock price above the call exercise price and continues to bear the downside risk of stock ownership if the stock price decreases by more than the premium received. Content of this article is provided for illustrative and educational use only and is not a recommendation or solicitation to purchase or sell any specific security or to implement a specific strategy. Multiple-leg option strategies can entail substantial transaction costs, including multiple commissions, which may impact any potential return. These are advanced option strategies and often involve greater risk, and more complex risk, than basic options trades.